I think it’s safe to say, no Christmas cookie platter would be complete without a smattering of these little gems–Russian Tea Cakes. The cookies are a form of jumble, which has been around since the Middle ages. They’re dense and buttery, very similar to shortbread; however, they’re rolled into balls, and dipped in powdered sugar, not once but twice. Despite their appearance, they’re not too sweet, which makes them all the more delicious. I’d like to imagine Grandfather Frost delivering these treats to children around Christmas, although that’s probably not the case. Grandfather Frost, or Ded Moroz, is Russia’s version of Santa Claus. In the days before communism, St. Nicholas was the Christmas figure and was highly revered. According to legend, Prince Vladimir traveled to Constantinople to be baptized and returned from his journey with tales of great miracles performed by St. Nicholas of Myra.Â It wasn’t until the communist regime, which was atheist, that Christian observances were suppressed, and St. Nicholas was transformed into Grandfather Frost, who brought gifts on New Year’s Eve. Christmas trees were banned as well, so folks began decorating New Year’s trees instead. While New Year’s continues to be the most important holiday, Christmas is celebrated once again. For some, Christmas is December 25. For the majority, though, who are Orthodox Christian, it’s celebrated on January 7, which is where Christmas falls based on the Julian calendar.Â Â Kutya, a meatless porridge, is a traditional Christmas Eve dinner, but in more religious households, the Christmas feast has a Holy Supper theme–12 dishes representing the 12 apostles. Meanwhile, Ded Moroz continues to deliver his gifts on New Year’s Eve and is accompanied by his granddaughter, Snegurochka, the snow maiden. Similar to the Santa of U.S.lore, he’s dressed in a red robe and sports a long white beard. He makes his rounds in a troika, delivering gifts to children who have been good. Rather than the North Pole, Grandfather Frost makes his home in the town of Veliky Ustyug, where children send letters with their Christmas wishes. Traditional Christmas cookies in Russia include pryaniki (gingerbread cookies) and kolyadki, a special rye cookie filled with curd cheese. Although Russian Tea Cakes appear to be a long-standing tradition there, from what I gathered, they’re mostly considered a Christmas staple here in the U.S. And as I mentioned, no Christmas cookie platter would be complete without them. The recipe below is from my sister, Diana, who has been making them for as long as I can remember. It’s all pretty simple, really. 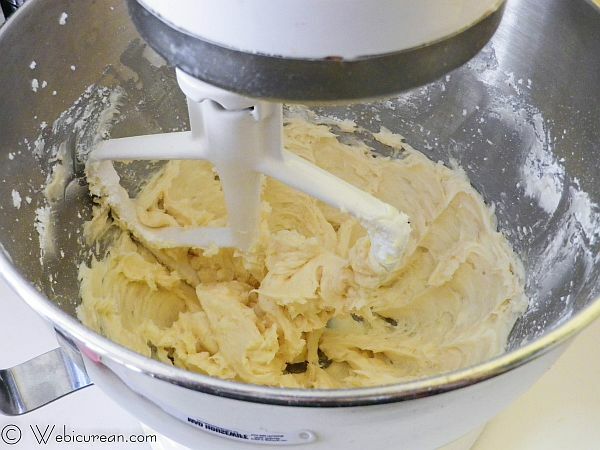 First, cream together the butter, sugar, and vanilla in your mixer bowl. Mix in the flour and salt about one third at a time to make a nice, stiff dough. 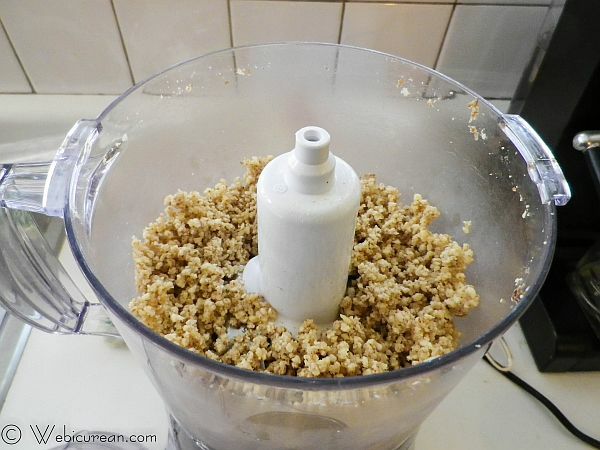 You’ll need about a cup of walnuts to make 3/4 cup ground, so grind them up, then stir them in. 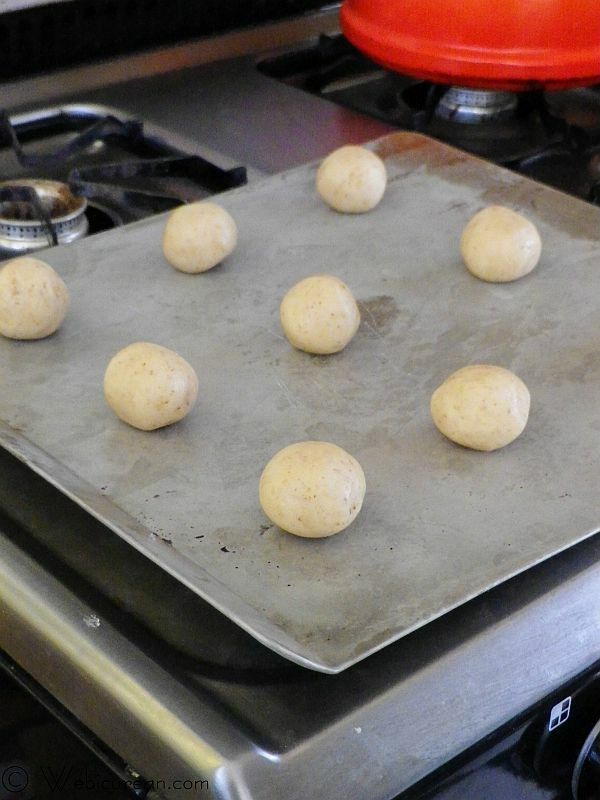 Roll the dough into 1 inch balls, and place them on an ungreased cookie sheet about 2 inches apart. Bake these until they’re set but not yet brown. While the cookies are still warm, toss them in the powdered sugar, then place them on a wire rack to cool. Once they’re completely cool, toss them in the sugar again. Fix yourself a cup of tea, and enjoy a nice Christmas-y snack! 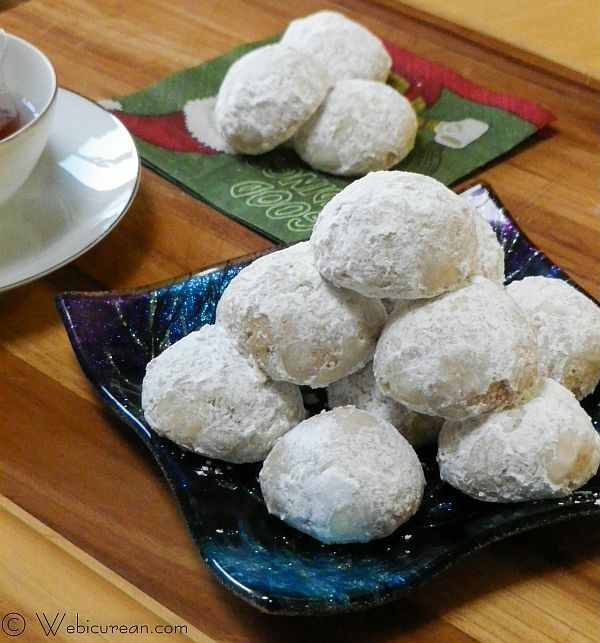 Dense, buttery, and coated with powdered sugar, these Russian Tea Cakes are a popular holiday treat. 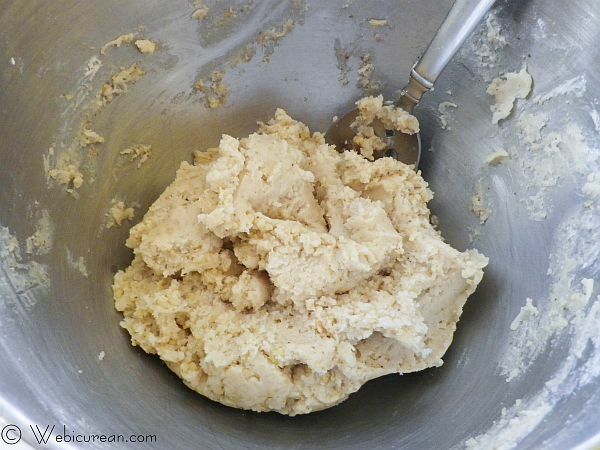 In a large mixer bowl, cream together the butter, sugar and vanilla. Sift together the flour and the salt, then mix into the butter mixture about one third at a time. 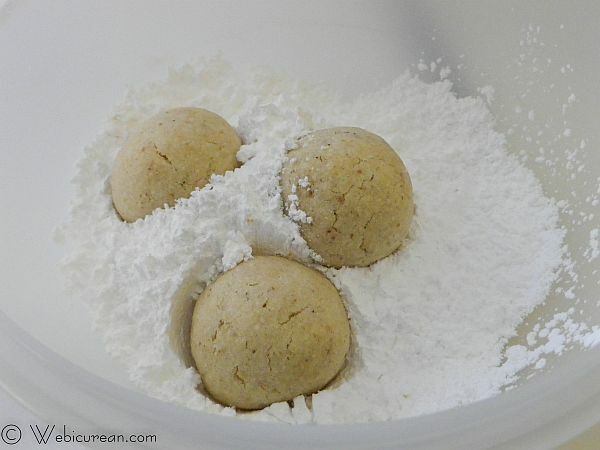 Using a spoon or a small cookie scoop to get the right amount, roll the dough into 1 inch balls, and place on an ungreased cookie sheet about 2 inches apart. Bake for 10-12 minutes or until the cookies are set but not brown. 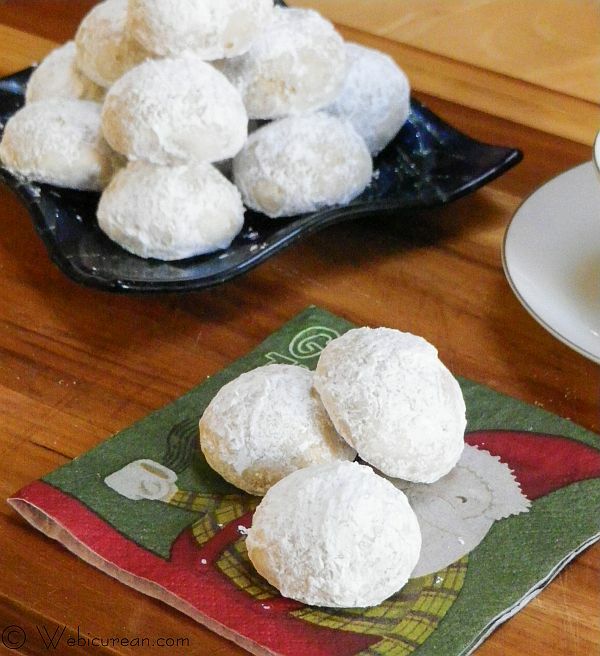 Place the powdered sugar in a bowl, and roll the cookies in it while they are still warm. 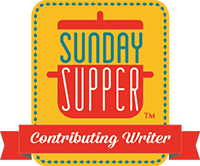 Allow to cool on wire racks, then roll them in the powdered sugar again once they have cooled off. You'll need about a cup of walnut halves to make ¾ cup ground walnuts. these are one of my favorite holiday cookies. they look great! Those look so good Anne and Morgan! We recently learned that Russia has an almost identical dessert with us Greeks. We also make the same dessert here in Greece called Kourabiedes, filled with almonds. Russian Tea Cakes looks tasty!!! Lemon flavoring instead of vanilla taste good for me as well.